Facts have been confirmed! The American kestrel (or Common kestrel), pictured atop this entry as she clutches her prey (which happens to be an unlucky mouse), while she alights upon a railing that surrounds my rooftop garden (in NYC), is a female. 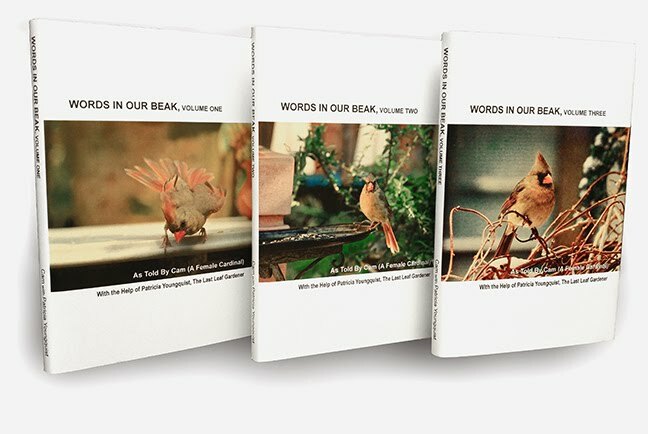 If you've been following my entries on Blogger, dear reader, than you might recall that I announced this bird's first time visit in an entry I published this past Thursday, where I include a photograph that is very similar to the one posted above. 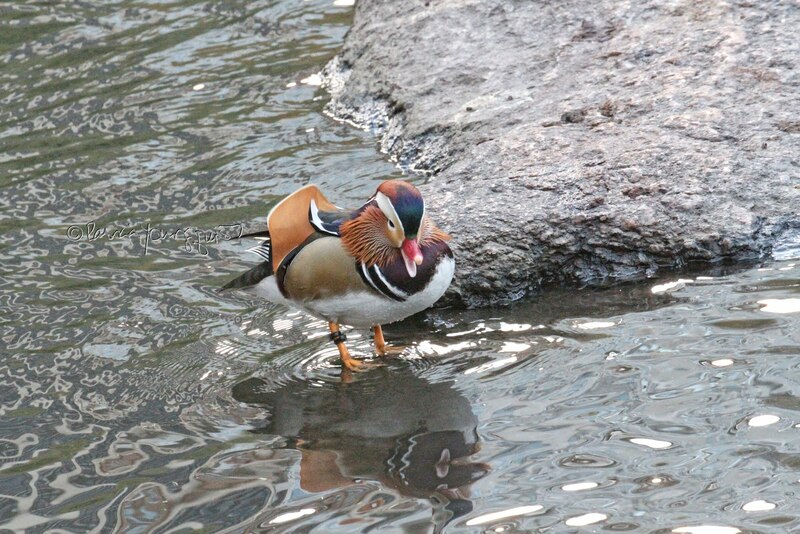 In the aforementioned post I also included the fact of how, initially, when I first saw this bird, I had mistakenly ID-ed the fauna's type. I followed up on Thursday's entry in a post here on Blogger, which I published yesterday. This follow up post includes a number of images as well as information on how I was able to confirm this bird's identification in terms of the classification. If you'd like to refer to Friday's follow-up post, please click here. At the time of my composing yesterdaty's entry, I had reason to believe my avian visitor was a female, but on closer examination of the pictures I had taken of the bird, I was not sure if my conclusion was correct. where the creature is alighting on the branches of my kiwi vines, meant that I was wrong in thinking the bird to be a female. Therefore, before I posted any "It's a GIRL!," rhetoric regarding this bird, I reached out to folks via a comment on my Facebook Page for The Last Leaf Gardener stating: "Me again, I'm going through some more photos that I took of this awesome bird and at first I had thought the gender was female. Now I've noticed the bird blue on the head! Do you still think it's a female, Amanda Remsberg? What say you, Leslie Monday and Joan Morris?" I've pointed out — within my cyber-postings — that these three individuals, were the first responders to my initial questions re the bird's classification. Subsequently, Joan Lindusky, weighed in as I have made a mention of in yesterday's blog post. 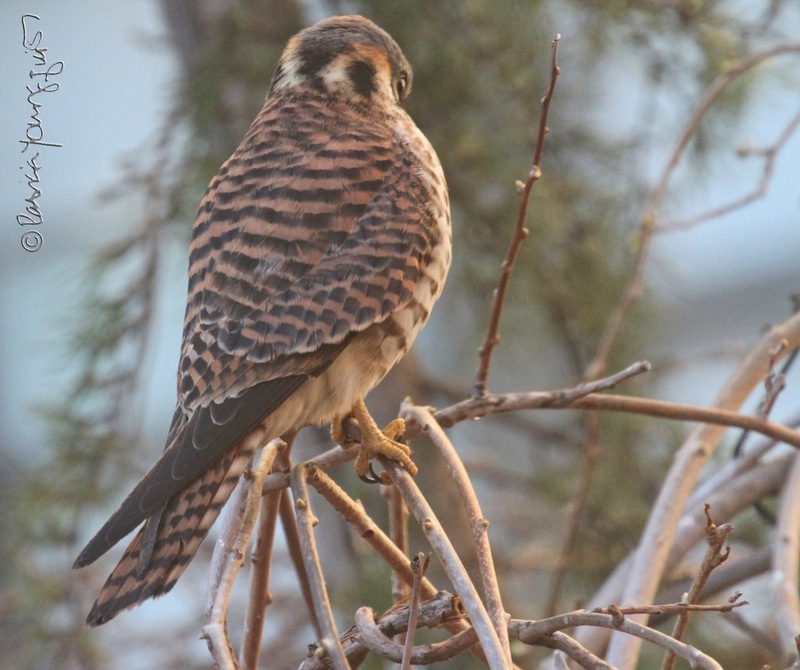 In any event, re the creature's gender, I received news, that my kestrel is, indeed, as I had thought, a female! The confirmation of my determination came to me in a comment, made yesterday by my FB friend, Amanda Remsberg, who is a bird rehabber. 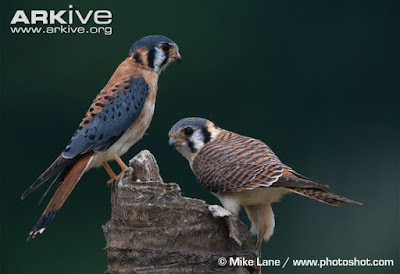 Amanda stated the following: "yours is a female, the males also have blue on the wings see this pic: http://cdn2.arkive.org/.../American-kestrel-pair-male..."
Rembsberg added a postscript to her comment stating: "sorry for the confusion, I had forgotten the wing part lolol." 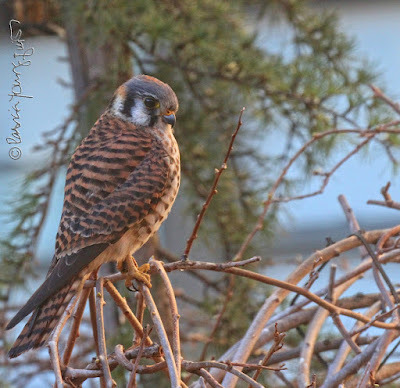 In her saying, "I had forgotten the wing part," Amanda was referring to a previous comment re the gender of my kestrel: "I believe she is female also, the males tend to have blue on their heads as well..."
I'm very grateful that Remsberg took the time to help me clarify this kestrel's gender, and I also want to thank Joan Morris for her input in this matter! 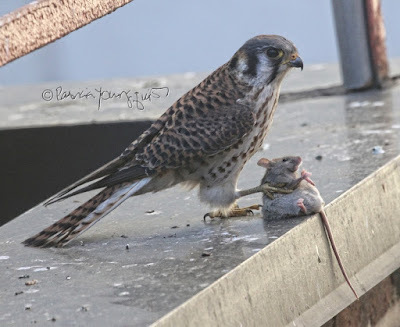 In a comment on my posting included within my FB Page for Patricia Youngquist, Morris stated: "Yes, you have a lovely American kestrel (great photos) in the act of eating an unfortunate rodent. I believe it's a female. 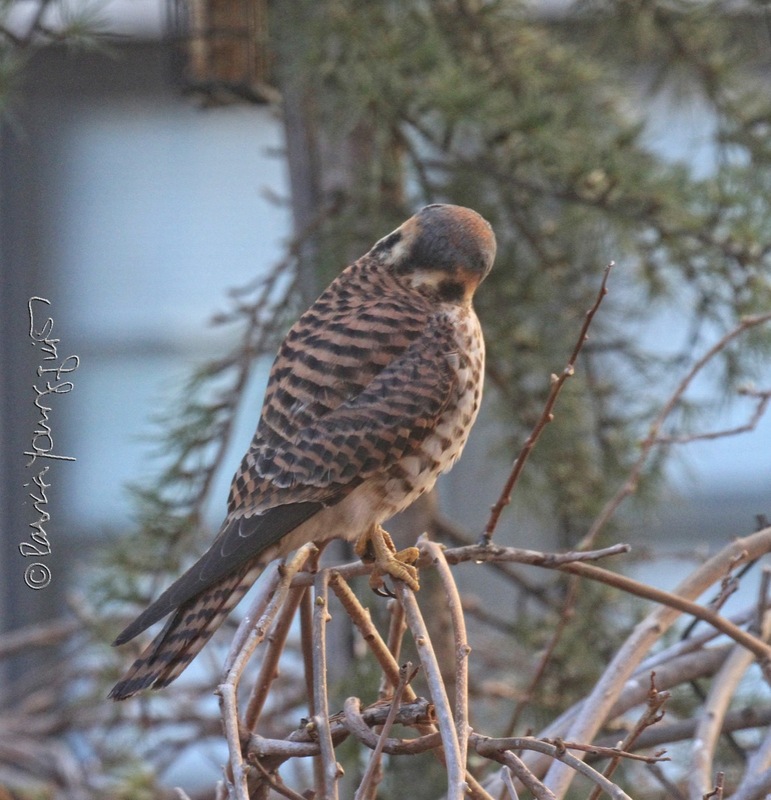 The male has slate blue on his wings and this one obviously does not...."
my kestrel, "obviously does not...." have blue coloring on the wings. 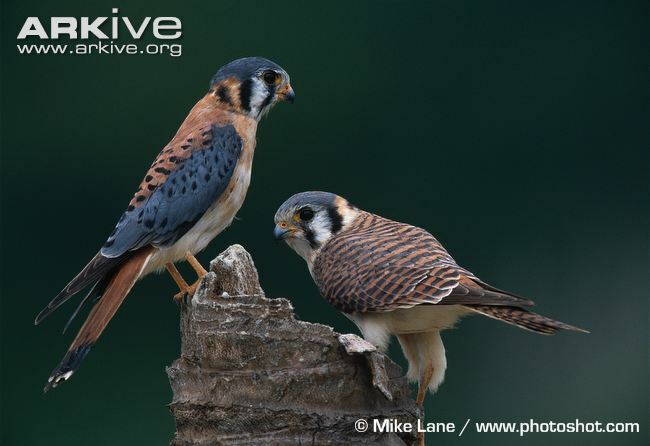 In light of all the help that I've received re information about my kestrel, I've decided to give her the name, A.L.J.J. ; as a way of paying homage to the women known by the names of Amanda Remsberg, Leslie Monday, Joan Morris, and Joan Lindusky; who in weighed in my questions (in order of how FB alerted me to their info). THANKS AGAIN!